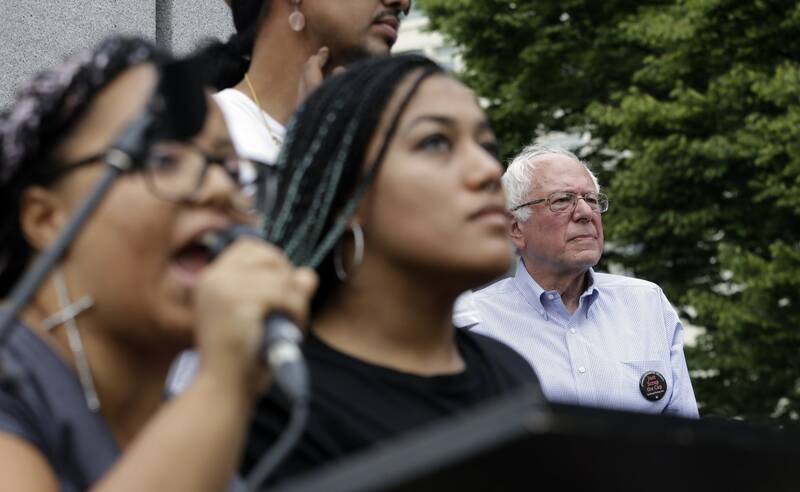 Democratic presidential candidate Bernie Sanders left a campaign event in Seattle without giving his speech Saturday after "black lives matter" activists took over the podium. It is the second time in a month that activists protesting racial inequality have interrupted an event featuring the progressive candidate. 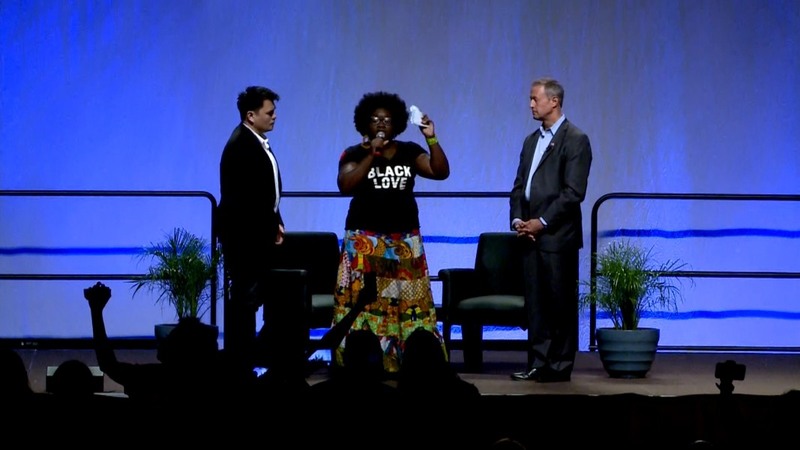 On July 18, "black lives matter" demonstrators entered a Netroots Nation forum featuring Sanders and Martin O’Malley in Phoenix and began chanting slogans. In Seattle, two women approached the podium just as Sanders began addressing the crowd of several thousand, and demanded the microphone. Sanders stepped aside, and one woman got into an argument with an organizer, shouting "We are angry!" After being given the microphone, and after the crowd booed, one of the women said, "I was going to tell Bernie how racist this city is ... but you already did it for me." One of the pair called for four-and-a-half minutes of silence in remembrance of Michael Brown, the black 18-year-old fatally shot by a white police officer in Ferguson, Missouri, nearly a year ago. 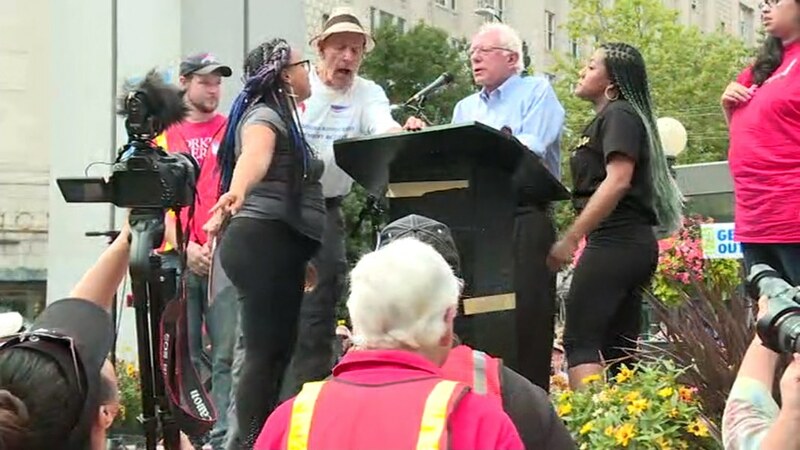 Some in the crowd began yelling, "Let Bernie speak," NBC affiliate KING5 reported. At one point there was a struggle as event organizers tried to regain control, before they called the speech off. Sanders shook hands with the crowd as he left the event, which was a Social Security and Medicare celebration, the station reported. "Not the ending we hoped for," an organizer told the station. Sanders said in a statement Saturday that the disruption was unfortunate. "I am disappointed that two people disrupted a rally attended by thousands at which I was invited to speak about fighting to protect Social Security and Medicare," Sanders said. "I was especially disappointed because on criminal justice reform and the need to fight racism there is no other candidate for president who will fight harder than me." On July 18, Sanders tried to address a crowd of roughly 3,000 at the Netroots Nation event in Phoenix, but many of the protesters shouted at him and disrupted his remarks. Sanders told NBC's "Meet the Press" moderator Chuck Todd last weekend that the "Black Lives Matter" activists raised an important issue, but he said economic inequality and institutional racism are "parallel problems" and both must be addressed at the same time. 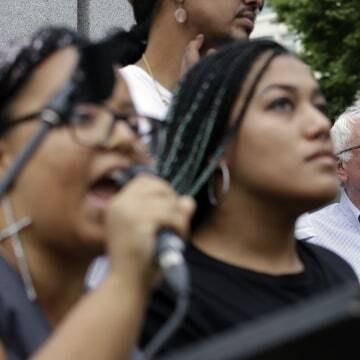 Later Saturday, the Vermont senator spoke at the University of Washington, telling the crowd, "No president will fight harder to end institutional racism and reform criminal justice system," according to KING5. "Too many lives have been destroyed by war on drugs, by incarceration; we need to educate people. We need to put people to work," Sanders said.